Other Products by Maxines Burn. Search other Weight Loss products. Maxines Burn Capsules is a unique blend of amino acids and herbal extracts aimed at supporting multiple areas of the body. Carnitine, Cayenne and Ginger, Raspberry Ketones and White Willow Bark all help to support the metabolism in numerous ways and aid in thermogenesis. This helps to keep the body fat off and may also help to prevent it from accumulating in those unwanted areas, which for most, is everywhere! L-Carnitine helps to shunt certain types of fatty acids from your blood into your cells where it then goes through Beta-Oxidation, which, for those of us who don’t speak science, essentially means it is converted to energy. This assists in fat burning, but may also help to improve your energy level, as you are literally supporting energy (ATP) production. Cayenne and Ginger are heating and stimulate a lot of metabolic activity, which can be noticed after consuming a meal of hot curry. To train effectively, and, hopefully enjoy yourself along the way (even during those gruelling gym sessions) it is important to carry with you the right kind of mood. Maxine’s Burn Caps contains several compounds that help to enhance your mood, one of which is Theacrine. This compound helps with Dopamine signalling. Dopamine is a part of the reward pathway in the brain-and we all deserve to feel rewarded, right? Acetyl-L-Tyrosine, a form of L-Tyrosine that crosses the blood brain barrier, also provide the precursor for Dopamine production, not to mention (or, realistically, I will) Adrenaline and Noradrenaline as well. L-Theanine, the specialised amino acid found in Green Tea, has an anti-anxiety effect, which can help to counter the effects of the caffeine found in this product, making your energy level smoother and without the jitteriness that so many caffeinated products can cause. Lets face it, we all want smooth energy … Additionally, the Acetyl-L-Carnitine form of L-Carnitine contained in this product also passes through the blood brain barrier and provides acetyl groups for Acetylcholine, a neurotransmitter that is essential for focus and concentration. 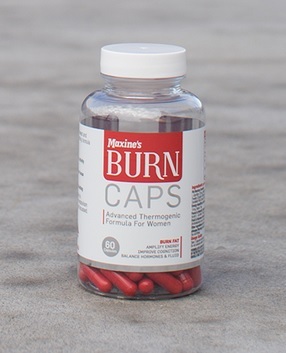 Maxine’s Burn Caps contains a well-known phytochemical called diindolylmethane or DIM (cruciferous vegetable extract), which, although may somewhat lessen the effects of androgens, is a powerful oestrogen modulator that gently encourages your metabolism to manufacture more benign oestrogens and less harmful metabolites. After all, oestrogen is a class of hormones, referring to estriol, estradiol and estrone, including many other metabolites. This metabolic shift may assist in fat burning and help to reduce fluid retention. Kelp is also included as a natural iodine source to support thyroid hormone production, which is probably the most essential aspect of supporting the metabolism. Uva Ursi Leaf, commonly known as Bearberry (bears not included), is a natural herbal diuretic that has been used in traditional herbal medicine for thousands of years. It help the body to regulate fluid levels, thus reducing any unwanted fluid deposits. Take two capsules with breakfast or lunch, or, alternatively, take one with breakfast and one with lunch. Do not consume on an empty stomach. Taking any caffeinated product in the late afternoon or evening may interfere with sleep, depending on your individual caffeine sensitivity. If you want the BEST TASTING protein powder, then this is for you. It tastes just like a chocolate milkshake - it has no aftertaste and mixes quickly with milk or water. It has a high amount of quality protein and almost no carbohydrates...an excellent choice if you're looking to lose fat while increasing / maintaining muscle. There's no cramps, farts or other unwanted side-effects when you take this protein and it leaves you feeling full and satisfied. Best of all, the 4.7 kilogram bag is great value for money! Each serve works out to cost about $1. Great taste, great quality and great value - what more do you want? Will Protein Powder Make Me Massive?